The peach harvest this summer is off the hook. They are at the farmers market every single week, no exceptions. They smell and taste amazing, are juicy and just perfect. One of my favorite recipes for peaches combines them with another summer staple: basil. While they may not seem like a natural combination the two together are mind-blowing. For this recipe I wrote it for one whole peach. I like to save the extra juice/sauce to pour over vanilla ice cream. The goop is that good it really is worth saving. I also think you could serve vanilla ice cream with the peaches themselves. They can be served hot, room temperature or cold – totally up to you. If saving the peaches in the fridge make sure to cover them with plastic wrap. Cut the peach in half and discard the pit. Wash the basil and remove the leaves from the stem. In a wide bottom sauce pan combine the sugar, wine and water over medium-high heat. Allow the mixture to come to a boil and let simmer for 5 minutes. Add to the mixture the basil leaves and the peaches cut-side down. 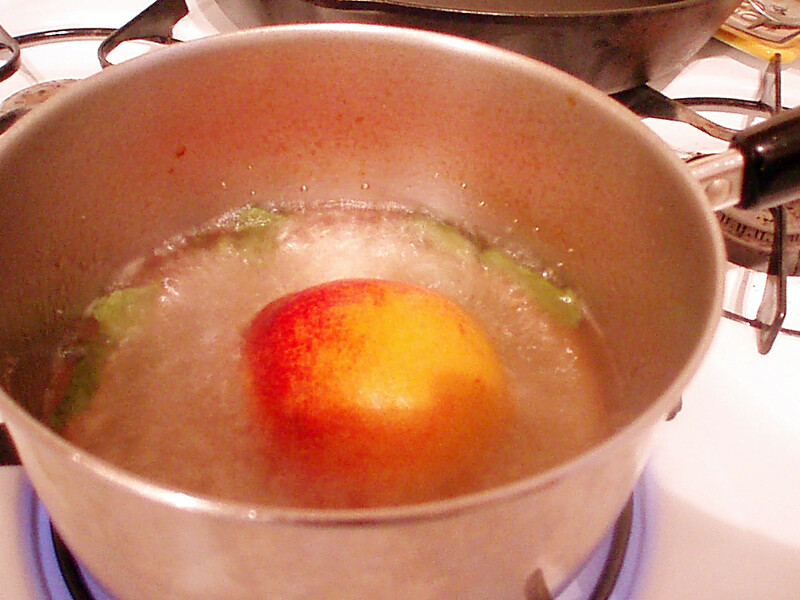 Cook for 3 minutes, and then using a slotted spoon turn the peaches and cook for another 3-4 minutes. Remove the peaches and place in bowls. Let the syrup to cook for 1-2 more minutes. Allow the peaches to cool a little and then using spoons, a fork or your hands carefully remove the peach’s skin. Discard the skin. Using a slotted spoon remove the basil leaves from the syrup and discard. Drizzle the syrup over the peaches, serve and enjoy! 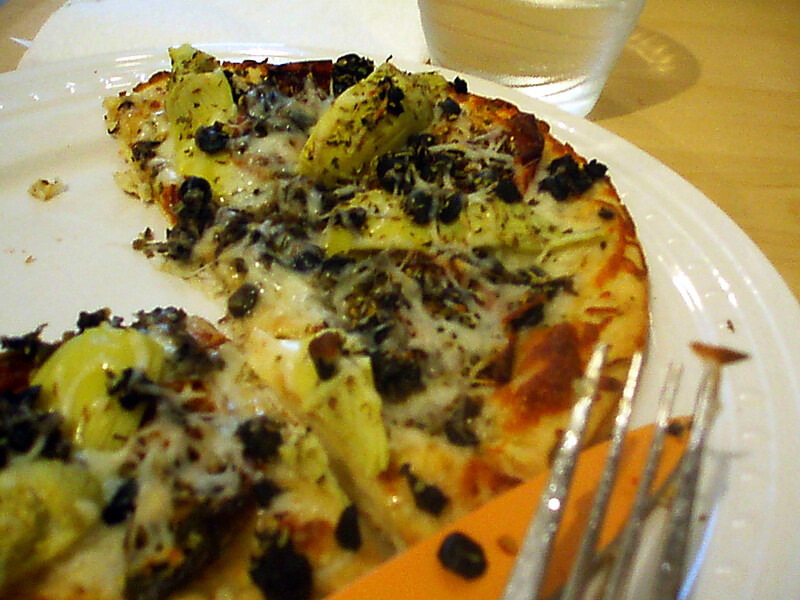 My friend Sara recently brought over a great dinner idea – a white pizza with Mediterranean inspired toppings. I made a slight modification to get to this recipe, and it turned out wonderfully. This is one of those meals that are easy to make on the fly on a weeknight. You can even add to if you are so inspired. I put a smaller amount of cheese on the pizza; however you like a really cheesy pizza you can certainly add to it. I also sized this for a personal pizza, but you can expand everything for a larger pizza. Just be sure to follow the baking directions on the crust you use. Preheat the oven according to the directions with the pizza dough. Cut the tomatoes in half or in slices depending on how large they are. If the artichoke hearts are whole or halves, cut them down into quarters to yield six (or more if you really like artichokes). Place the dough on a baking sheet. Spread ¾ of the cheese onto the dough evenly. Arrange on the dough the artichokes, tomatoes and olives. Sprinkle the oregano and red pepper flakes evenly across the pizza. Bake according to the dough’s directions. When finished allow to cool for a few minutes, serve and enjoy! The farmers market is in full swing right now. It’s like sensory overload. Right now one of my favorites is the heirloom tomatoes. I decided to take some advice from Martha Stewart’s Living Magazine and try drying them myself. I recommend Roma tomatoes or bigger, though you can also dry cherry tomatoes. The big variable with drying tomatoes is how long they will take. So if you are going to try this have a lot of time blocked off. My tomatoes were plum sized, I cut them in half, and they took a solid 3 hours. But tomatoes can take as little time as 1½ – 6 hours. It’s a low and slow process. So it’s important to be patient and also keep an eye on them regularly. Preheat the oven to 250° Fahrenheit. Cut the tomatoes in half or into slices at least ¼ inch thick. Arrange the tomatoes on a baking sheet lined with either tin foil or parchment paper. If tomatoes are halved place cut-side up. Sprinkle the tomatoes with salt to create a thin layer. Next sprinkle the tomatoes with sugar to coat with an even thin layer. You do not have to use all of the sugar, or use more if you are drying more tomatoes. 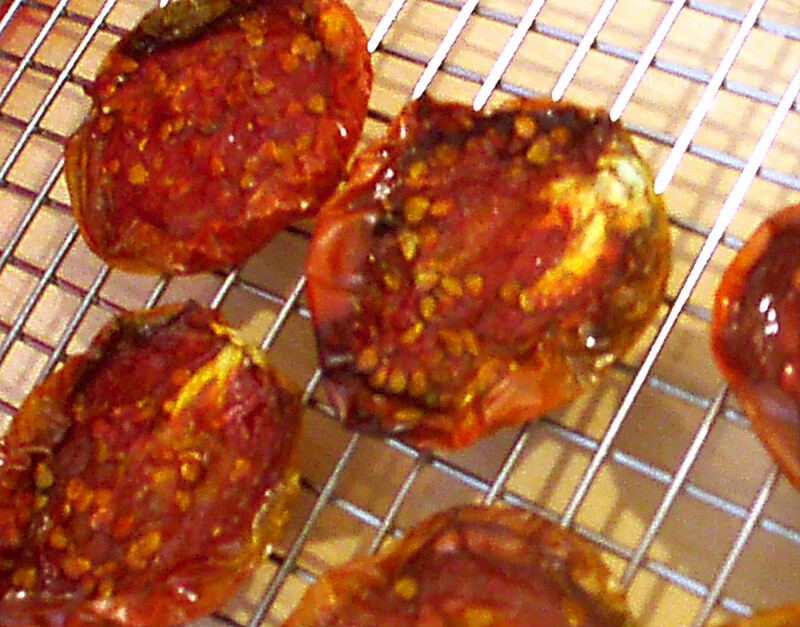 Place the tomatoes in the oven and cook until dried out, checking on the tomatoes every 30 minutes or so. You’ll know they are dried out when the edges shrivel and the juices stop running. Allow to cool on a wire rack, serve and enjoy! When my friends and I get together we always somehow wind up snacking in a very orderly fashion: crudités, cheese, crackers and of course hummus. It’s a staple not only with my friends but also at home. Once my dad realized how easy it was to make it became a staple in our refrigerator for casual snacking. Hummus really is a fantastic snack. I won’t make health claims (though how bad can chick peas with some olive oil really be? ), but its versatility alone is compelling enough to keep it around regularly. You can eat it with pita, pita chips, pretzels, Wheat Thins, carrots, celery, cucumbers, bell peppers, broccoli, zucchini… the list goes on and on. But what makes hummus truly special is how simple it is to make different varieties and “flavors.” Below I’ve written the “base recipe” but have also included add-ins to make different varieties of hummus. There are two big tips about hummus before the big show. First, make sure to stir the tahini well before measuring it out. It tends to get really hard at the bottom and really oily at the top – you want all of that good stuff. Second, if you want a “thinner” hummus like what you buy at the grocery store add just a little bit more water, but do it slowly so you don’t wind up with runny hummus. Peel the garlic cloves and set aside. Squeeze the juice of the lemon into a small bowl and remove any seeds that fall in. 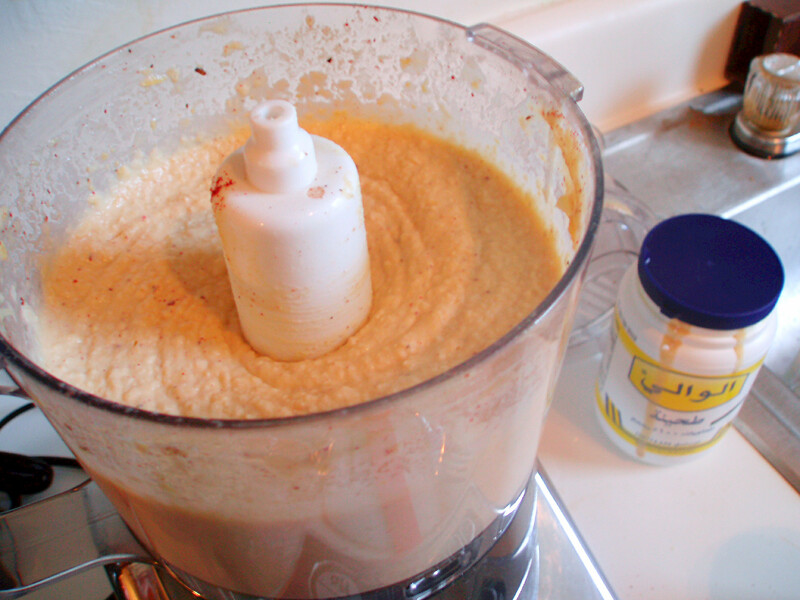 Give the tahini a big stir to make sure its well mixed. Open the can of chick peas and drain out the liquid. Load up into the food processor or blender the chick peas, tahini, olive oil, water, garlic cloves, lemon juice, salt, pepper and any add-ins. Using a spoon give it a taste test to make sure it’s the consistency and flavor you like. If needed add more seasoning or water to adjust and blend again briefly. Just be sure if you want to add more water that you do it slowly with one tablespoon at a time. Once it’s as you like it serve it out and enjoy! I don’t know why, but I absolutely love tabouli, sometimes also spelled tabouleh. I find it to be a very refreshing salad, and enjoy piling it up on pita with hummus. The one thing about tabouli though, is that I have found a big difference among the tabouli you buy at the grocery store, are served in restaurants and what you make at home. The grocery store and restaurant varieties have more parsley and less bulgur wheat, whereas the homemade version features the bulgur more. This version features more bulgur, but it’s not totally overwhelming. This recipe is written as I make it – with a food processor. If you do not have one, all of the ingredients that go into the food processor can be chopped into a fine mince. This will require just cutting the parsley, mint, scallions and garlic to smithereens. It is totally doable; it just takes a bit more work. I also made one special substitution in this batch that I really liked. Instead of garlic cloves I used one garlic scape in the recipe. It added the delicious garlic flavor without the harsh garlic punch. If you have access to garlic scape I highly recommend using it instead. In a medium pot bring the water to a boil. Once boiling, pour in the bulgur wheat and turn off the burner. Allow the bulgur wheat to sit in the water for 30 minutes to hydrate. While the bulgur is hydrating wash and peel the cucumber. Remove the seeds and cut the cucumber into a small dice using the method in this video and set aside. I recommend cutting the cucumber into smaller sticks then done in the video. Wash the tomato and cut into quarters. Remove the seeds and then cut the quarter into slices, then chop the slices to create a dice. Set aside. Squeeze the lemon juice into a small bowl, removing any seeds that fall in and set aside. Wash the scallions and chop off the white roots and discard them. Then chop the scallions into 1 inch pieces. Set these aside. Chop the tough stems off the bottom of the parsley. It is ok to keep the small stems at the top by the leaves. Strain the bulgur from the water and pour the bulgur into a large bowl. Splash with one tablespoon of the olive oil and stir to coat. Add the tomatoes and cucumbers to the bowl with the bulgur. Add to the food processor the garlic and scallions. Pulse until pulverized. Add this to the bowl with the bulgur and veggies. Add the mint and the parsley to the food processor. Pulse until the leaves and stems are chopped down significantly. If you cannot fit all of the parsley into the food processor bowl at once you can do this in batches. 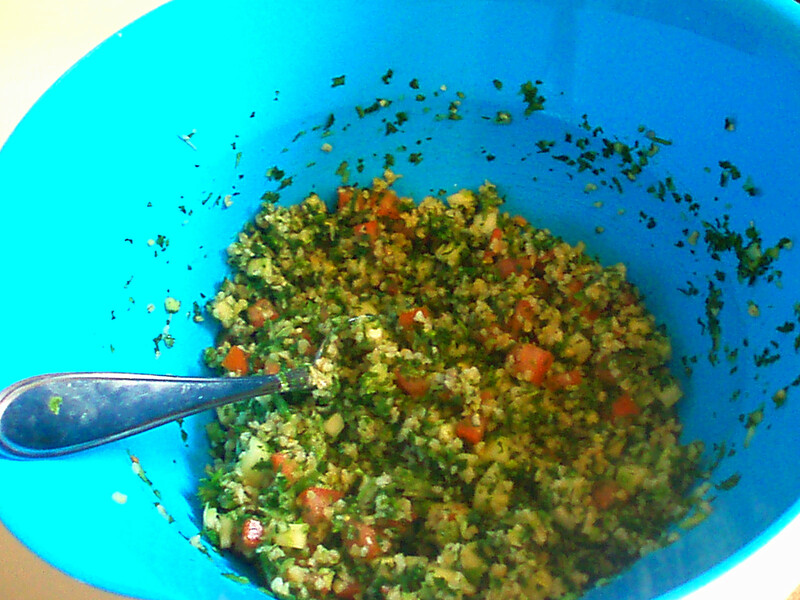 Pour the parsley and mint into the bowl with the bulgur and stir well. In the small bowl with the lemon juice add the salt and the remaining olive oil. Stir well and then pour over the tabouli in the larger bowl. Stir the salad well so that it is evenly coated, serve and enjoy! After hearing a friend grumble that he can't cook, I've taken up the challenge of proving to the culinary-challenged that cooking is easier then it looks. Food is never intimidating, it is your friend.